The acronym FODMAP stands for Fermentable Oligosaccharides, Disaccharides, Monosaccharides And Polyols. These short-chain carbohydrates are incompletely absorbed in the gastrointestinal tract and can be easily fermented by gut bacteria1.These sugars also exert an osmotic effect, increasing fluid movement into the large bowel2 The fermentation and osmosis caused by these undigested sugars are a cause of major IBS symptoms such as gas, pain, and diarrhea. So what causes FODMAP intolerance? In some cases, small intestinal bacterial overgrowth, also known as SIBO, contributes to the development of IBS symptoms and FODMAP intolerance3 The presence of pathogenic bacteria in the small intestine causes excessive fermentation of these carbohydrates, increasing gas production and allowing for the proliferation of uncontrolled gut bacteria. 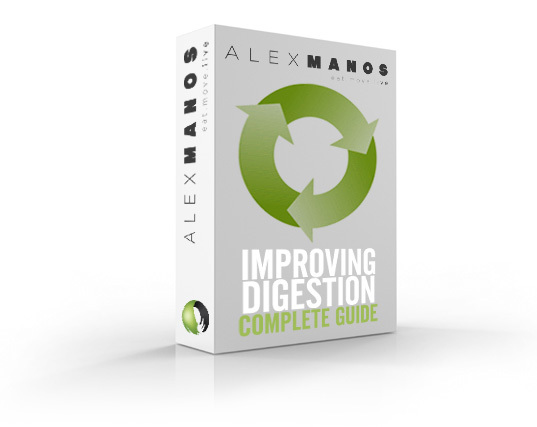 In other cases, certain individuals may lack adequate enzymes to break down and absorb the fermentable sugars before they reach the colon, contributing to the osmolarity changes and bacterial fermentation that occurs in the large intestine. Of course, emotional and physical stress are also known to be contributing factors to the development of IBS, and could induce FODMAP intolerance for reasons not yet fully understood4. In these cases, disturbance of gut microbiota is a likely causative factor; as we know, stress alters the gut flora significantly and could be the reason why stress, FODMAP intolerance, and IBS are so closely linked. How can you treat FODMAP intolerance? The most important goal has to be addressing the underlying imbalance contributing to the symptoms. One of the most common imbalances is intestinal bacterial overgrowth. In addition to addressing gut bacteria, following a low FODMAP diet seems to be the most effective dietary intervention to help reduce chronic IBS symptoms5 Many clinical trials have shown a high level of success from IBS patients who reduce or eliminate FODMAP containing foods from their diet6,7. In addition, avoiding gluten may help reduce IBS symptoms further, according to some research, and certainly from my clinical experience8. At the Advanced Practice Module with The Institute of Functional Medicine I was given this great handout, The FODMAP Diet , which highlights different types of FODMAPs and the foods they are found in. You may be consuming a FODMAP-rich food without knowing it, and reducing or eliminating consumption of these foods may help alleviate IBS symptoms. This chart also provides a list of low FODMAP foods that can be enjoyed in place of these problematic foods. Below highlights the nutrient content of 4 foods. 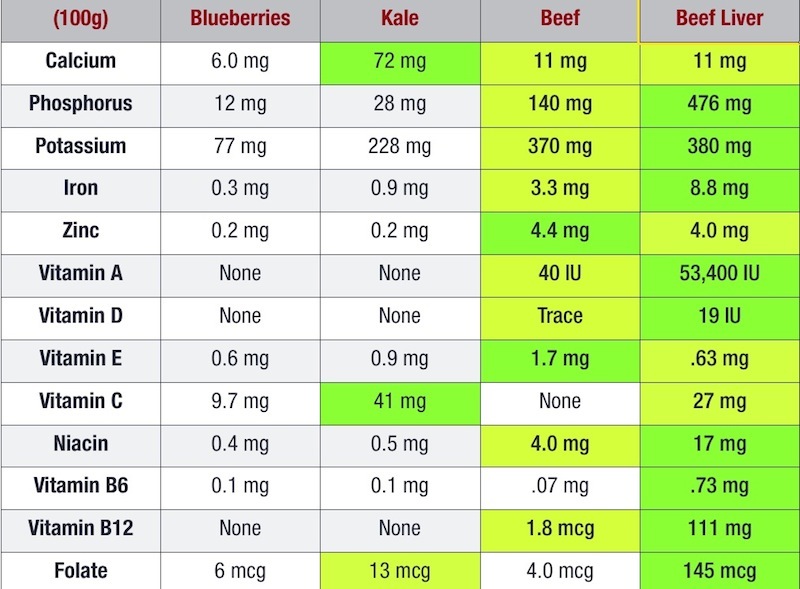 Notice how nutrient dense beef and beef liver are. Over the last couple of years I have really changed my views on regular red meat consumption. While you have to appreciate we are all individual in my experience many people do well eating red meat on a regular basis. After all it is a great source of iron, B vitamins and Zinc (among others). Yep, that’s right. He said fewer vegetables. From experience, this strategy can work for some people. And in fact their nutrient status may well improve as a result due to a healthier digestive tract. For more information on digestive health and whether nutritional therapy may be of benefit please do make contact and keep an eye out for future blog posts related to IBS and digestive health. While there is research suggesting that a FODMAP diet may be an effective nutritional strategy for those with IBS it is not something I would necessarily start with. It is quite restrictive and I have had clients come to see me because they have been put on this programme and just found it too hard. One solution to this is to start with just one of the groups, such as lactose. It is possible you will experience improvement in your symptoms without having to remove all of these foods. From experience there is often a threshold when symptoms are expressed. Therefore by simply limiting these foods you may be symptom free.